EasterBabe’s Theory did not receive compensation for this post and is not responsible for prize fulfillment. I'd pick the Thin Mint scent. I would choose the "Caramel Stripes" scent for sure! I'm actually eating Girl Scout cookies right now; Caramel Delights…yummy! I think I would choose Chocolate peanut butter. I would pick the Thin Mint! That's the one I like. Thanks for the opportunity! 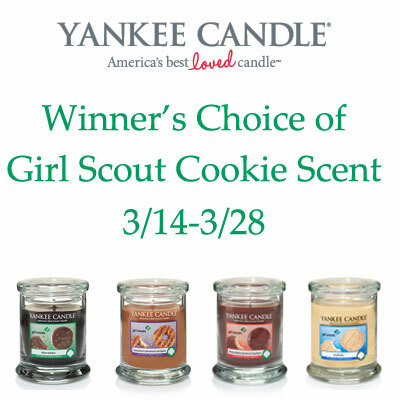 I would choose the Trefoils or the coconut caramel stripes. I would choose the Thin Mints to eat, as well as the Thin Mints as a candle.